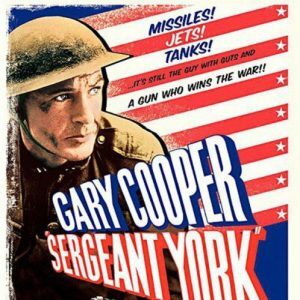 Sergeant York is the story of World War I hero who captured German position single-handedly. It begins with his early life, and conversion, and his inner conflict over going to war. I truly enjoyed Sergeant York on multiple levels. It’s a (fairly) accurate biography of the actual Sergeant Alvin York. And, it doesn’t whitewash or pull any punches. At the beginning of the movie, York is living in the backwoods of Tennessee. His family farm is on rocky ground, and it’s hard work to make a living there. And Alvin’s hard working, hard drinking, fighting man. An angry man, who nearly kills a man in revenge. And then, Alvin York literally has a come-to-Jesus moment. And he becomes a changed man. A man who bows to the Bible in everything, and becomes a pillar of his community. When World War I breaks out, he refuses to defy the Bible and kill the enemy. His pacifist views prevent him from enlisting. However, after being drafted, he’s faced with Biblical truths that he hadn’t thought of. It’s an honest, well-depicted struggle by a man of conscience. In short, Sergeant York is an excellent film, which I highly recommend.